I love baby led weaning lunch ideas that can be eaten on the go. I quite enjoy packing a little lunch box for Dex when we are going out and about; I include a Babybel, a yoghurt, some fruit, cucumber sticks and something like a sandwich or pinwheels. 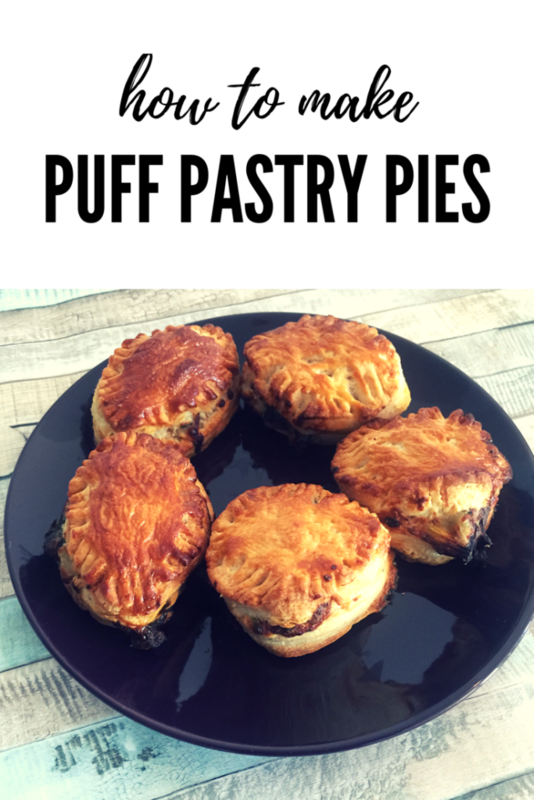 His appetite is increasing every week as his need for milk reduces so I thought why not try puff pastry pies? 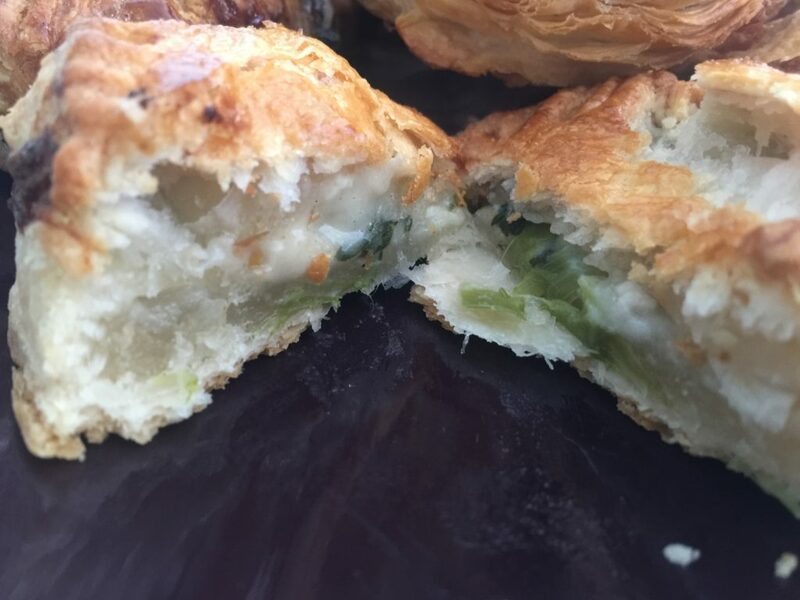 You can use such a huge range of fillings for these puff pastry pies, but for this particular recipe, I went with a creamy cheese sauce with chicken and two of his favourite veg: leeks and spinach. I can’t proclaim that these are particularly healthy, but they are delicious and make a change from boring sandwiches. In a frying pan, add some finely diced chicken, leeks and spinach with a little olive oil and fry gently. Meanwhile in a saucepan, heat 100ml milk slowly until it is simmering, then add the tablespoon of flour to thicken it, before throwing in the cheese. Keep stirring continuously and take off the heat as it thickens. Add the cheese sauce to the chicken/leeks/spinach and combine thoroughly. Once you are sure the chicken is cooked through, take off the heat and transfer to a bowl. Once the puff pastry is ready to use, roll it out and cut out circles using a cup or a glass. I wanted to make quite small pies so used a child’s paintbrush cup. I was bale to cut out 16 circles in total. Take a baking tray and line with greaseproof paper. Place eight of the puff pastry circle on it. In a bowl beat an egg and add a tablespoon of water- this is your egg wash.
Brush the outer circle edges of the puff pastry circle and in the centre, dollop a little of the mixture. Be careful not to overfill. Grab one of the puff pastry circles that hasn’t been placed on the baking tray and put it on top of the other. It should stretch over the edges. You a fork to press the edges down so that it forms a seal. Repeat with the other seven circles. Place in the oven and cook for 20 minutes or until golden brown. Ensure you leave the pies to sufficiently cool before offering them to baby- they will be piping hot. Dex seemed to really enjoy these pies. The flaky pastry makes easy eating and the filling is truly scrumptious. They are perfect for grabbing ready for lunch on the go. These can be frozen and reheated. I defrosted them overnight in the fridge after freezing, then microwaves on half power for 1 minute. Again, be careful as they will be very hot. I hope you enjoy these puff pastry pies. I was a massive fan! 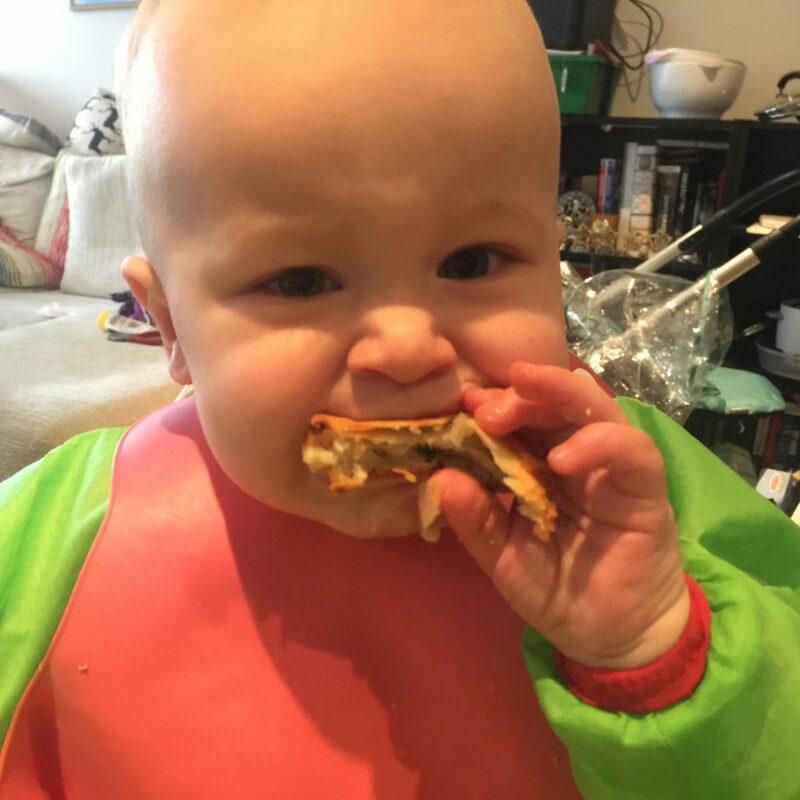 Check out more of my baby led weaning recipes here. Once the puff pastry is ready to use, roll it out and cut out circles using a cup or a glass. I wanted to make quite small pies so used a child's paintbrush cup. I was bale to cut out 16 circles in total. Brush the outer circle edges of the puff pastry circle with egg wash. In the centre, dollop a little of the mixture. Be careful not to overfill. Grab one of the puff pastry circles that hasn't been placed on the baking tray and put it on top of the other. It should stretch over the edges. You a fork to press the edges down so that it forms a seal. Brush the pie with egg wash. I don’t know about feeding them to the baby, I want to keep these all for myself!!! Love puff pastry pies but would never think to make my own! I love these pies. I subbed out one leek for a bunch of spring onions, and that gave it more colour without any real impact on the taste. I’ve made this as one big pie and smaller individual pies. both were great and a real hit with my family. I like to bag the smaller ones in individual sandwich bags and freeze them for the long term for when I’m not in the mood to cook.